I had previously covered some apps (USB Disk Ejector and USBDeview) that make it easier to unmount external drives. Most of such utilities focus on unmount process itself and leave getting drive ready for it (like closing portable software) to user. 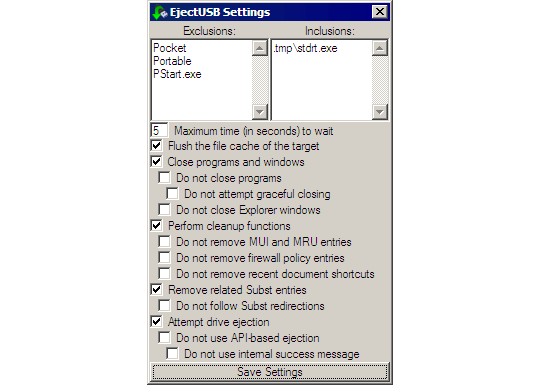 EjectUSB prepares drive for unmount so you don’t have to. App has no graphical interface and attempts to eject either drive it runs from or by drive letter supplied as command line interface. However there is GUI for extensive options that are saved to INI file. clean up of registry and recent entries pointing to drive. All parts of routine can be chosen to not run if needed. very customizable and easily scriptable. While app is quite powerful it comes with quirks natural for complex tasks, such as mass closure of applications. For example Opera@USB, instead of being closed quietly, crashes, restarts and only then closes again. I had also encountered few times when EjectUSB failed to eject my external hard drive and was just sitting in tray, doing nothing. App can be major time saver for portable toolkits and external media. However it must be first properly tested to ensure it will work with specific choice of software and hardware.